About 160 arrests have been made as disturbances took place on a second day and night in the West Midlands. There was looting in Birmingham city centre, Wolverhampton and West Bromwich on Tuesday night and two ambulance response cars were attacked. A 32-year-old man will be questioned on suspicion of murder after three men were run over and killed in Birmingham. Witnesses said the men were protecting property in the Winson Green area when it happened at about 01:00 BST. The men aged 31, 30 and 21 were taken to City Hospital following the incident on Dudley Road. A large scrapyard fire in the Nechells area of Birmingham on Wednesday morning was not linked to the violence, police said. There had been 160 arrests up to 03:00 BST on Wednesday since Tuesday afternoon, taking the total to about 300 since disorder began, the West Midlands force said. The arrests were for a variety of offences including aggravated burglary, violent disorder and various other public order offences. Nineteen people have been charged and remanded to appear in court on Wednesday following the disorder in Birmingham over the past two days. A total of six police officers have sustained minor injuries in the overnight disorder. Police have been investigating reports that shots had been fired in the Aston area of Birmingham. Riot police were on the streets and surrounded The Mailbox shopping complex in the city centre. Two ambulance response cars were attacked in separate incidents with bricks and other objects thrown at them as they responded to 999 calls in the city centre. Staff driving them were not injured, but they were left shaken by their experiences, the ambulance service said. The service attended 35 incidents in Wolverhampton, West Bromwich and a number of areas of Birmingham. A total of 31 patients were treated by ambulance staff with 19 requiring hospital treatment, but the majority of incidents were relatively minor assaults, the ambulance service said. Dudley Street, in Wolverhampton, and High Street, in West Bromwich, were closed on Tuesday evening as youths gathered. Several more roads in West Bromwich were also shut and two cars were set on fire. Shops, including a branch of Marks & Spencer and a hi-fi store, were targeted in Birmingham. Derrick Campbell, from Race Equality Sandwell, was caught up in trouble in Birmingham on Tuesday as youths surrounded his car outside the council house. He said the rioters looked to be 17 or 18 years old and he described them as "opportunistic young thugs". He said: "Fifty youths with balaclavas and sticks were running towards me. "About five feet in front of me they started attacking the Sky News van. They started hitting it with sticks. "It was an unreal experience. I didn't feel in control, I knew I was in danger, and I dropped my phone. "I knew I needed to get out of there but my hand was shaking that much I couldn't turn the key. It happened so quickly." The force said there were some pockets of disorder in Wolverhampton, where some stores had been broken into, in West Bromwich and in Birmingham city centre. The group in West Bromwich later dispersed, police said. 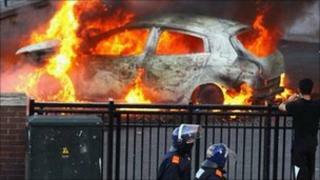 In Birmingham, some shops were attacked and a car was set alight in Moor Street. A van was set on fire in Bordesley Street where looters reportedly targeted a cafe, smashing its windows and helping themselves to food. A shop window was broken and youths were reported to be playing "cat and mouse" with police. There was also disorder in Kings Heath during Tuesday afternoon where a police vehicle was slightly damaged. In Birmingham and Wolverhampton, buses had stopped entering the city centre on Tuesday evening. Mr Campbell, speaking to the BBC shortly before his car was attacked, said: "We want to send a message to the community, go home, stay off the streets. "We also want to send a message to the police that they need to take whatever action is required to ensure that people and property are protected." Shops in Birmingham closed early on Tuesday afternoon and the Harvey Nichols store in The Mailbox was boarded up. People at the Eric Beckett jewellers site on Queen Street, Wolverhampton, were among those cleaning up in the city after shops were looted. Mr Beckett, who has been in the street for 40 years, said money, watches and ornaments were taken. "Don't know when [we should] open now, could be a month, two months, just don't know. "I've got to have windows put in. I honestly don't know what we're going to do." Deputy Prime Minister Nick Clegg arrived in the city at about 14:30 BST on Tuesday and met police at the West Midlands Police Lloyd House headquarters. He was booed by crowds who shouted "go home" during a walkabout. Mr Clegg said there was "simply no excuse whatsoever for the violence, looting and destruction". The 19 people have been charged for various offences including burglary, theft and violent disorder. They will be appearing at Birmingham magistrates' and Wolverhampton magistrates' court, police said. A further four have been charged and bailed pending their appearance at court, the West Midlands force added.